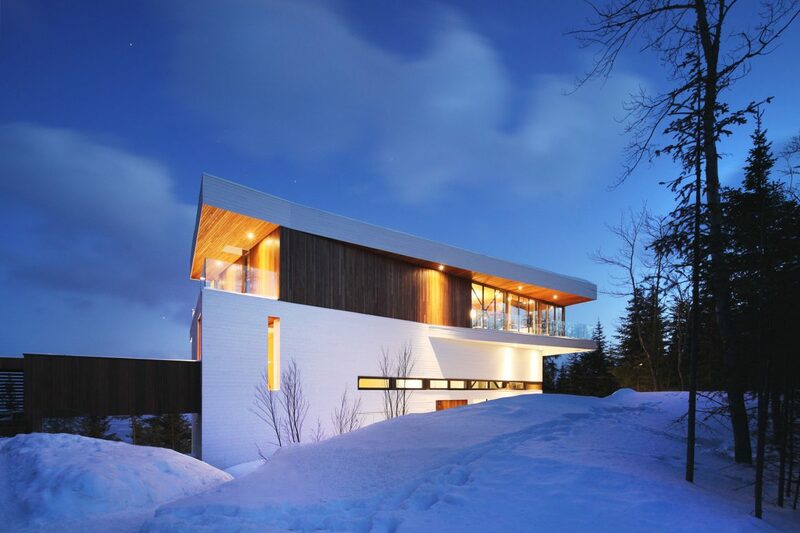 By Marc Turgeon’s own admission, one is more likely to encounter a moose than another human being near his stunning home in the Charlevoix region of Quebec. For a guy who is transparent about his well-documented “wild side,” some may say the home – on the shores of the St. Lawrence River in a town called Petite-Rivière-Saint-François – appeals to that side of Marc. Others may argue that the tranquility of it is meant to calm him. In fact, it is probably a little of both. As someone who previously owned two sailboats (one aptly named Le Temps Sauvage, or Wild Time), Marc clearly loves navigating life both on the cusp of a wave and in placid waters. 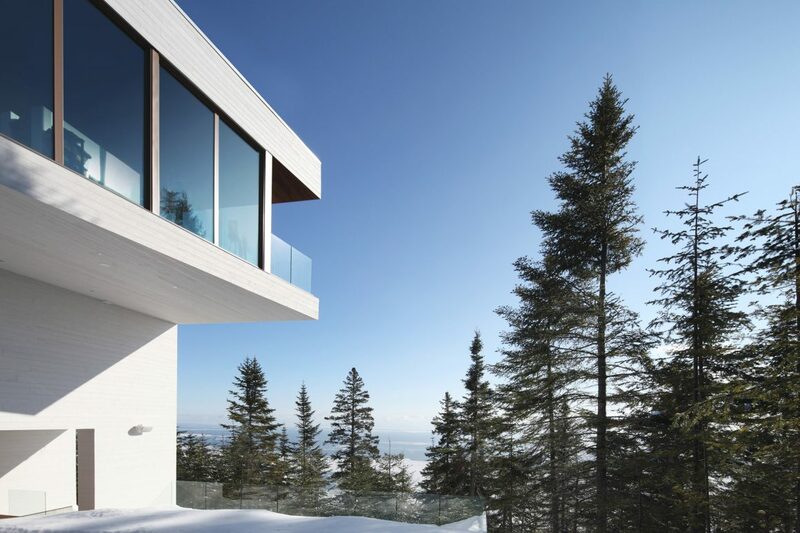 Which brings us back to his unusual home, towering above the river that dominates this picturesque region of Quebec. (At 1,696 feet above sea level, it is higher than the lookout level of the CN Tower in Toronto, which stands at 1,135 feet). 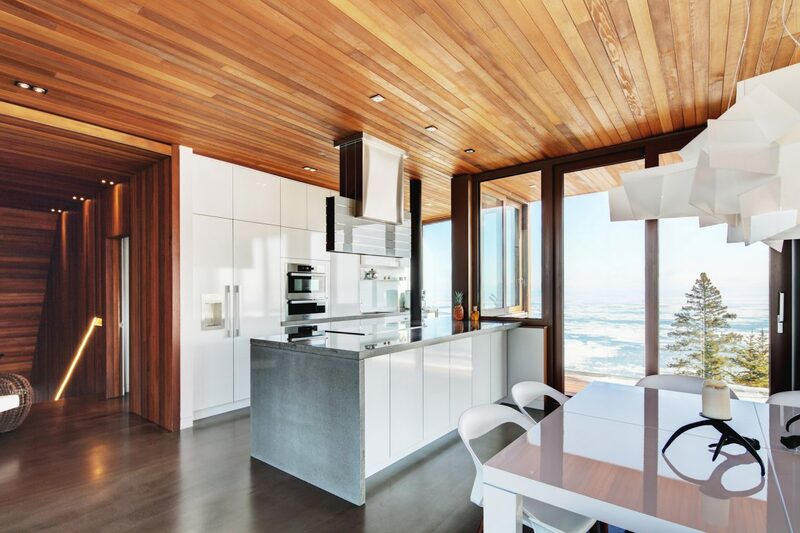 Built of white pine that has been painted white, with red-cedar trim, the house is meant to capture the feel of the sailboats Marc has so loved. 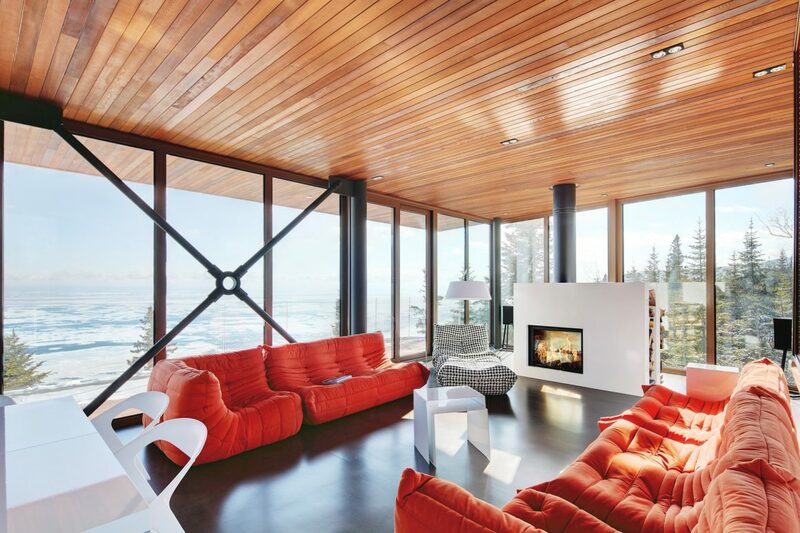 The homeowners didn’t want their home near Le Massif in Charlevoix to be a typical ski chalet. The Stûv fireplace bestows warmth and a contemporary look on the living room, which gets structural support from the X braces. The Ligne Roset sofas underscore the colourful painting by Dominic Besner, which is suspended for maximum impact on a wall of windows as it is a favourite of the homeowners. 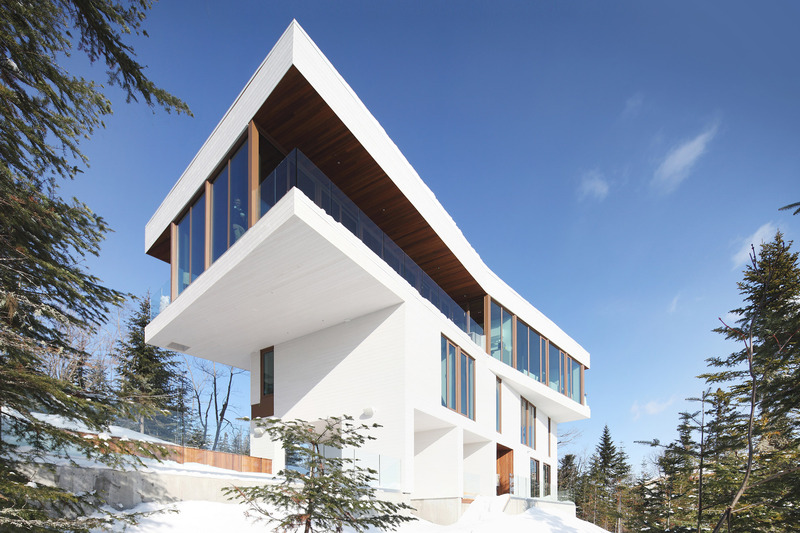 Marc and Nancy knew what they wanted when they decided to build near the Le Massif ski area. 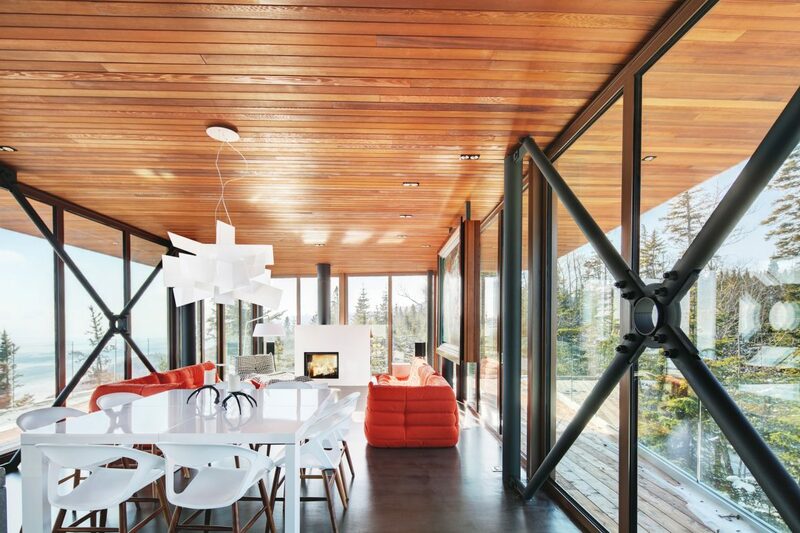 But they needed someone to interpret and realize their ideas, and they recognized the right connection as soon as they met architect Olivier Bourgeois, of a then-upstart, innovative firm called Bourgeois/Lechasseur Architectes in Quebec City. 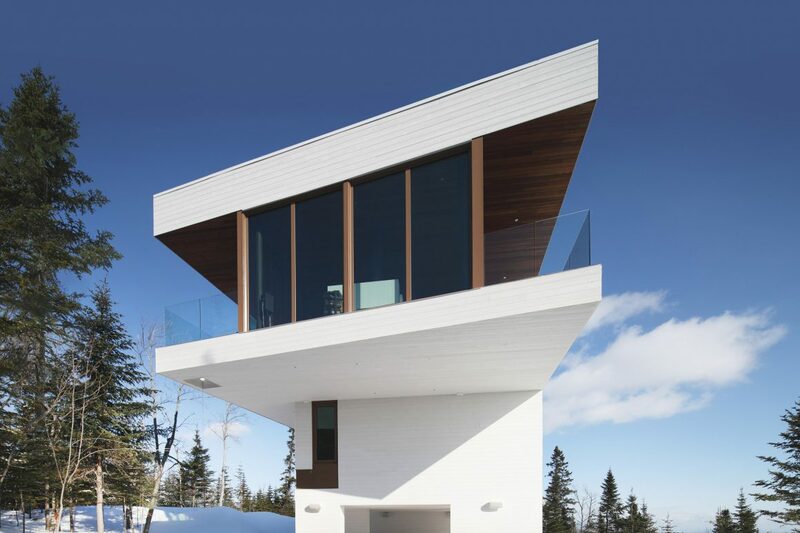 Inspired by the couple’s love of sailing, the design of the house makes the structure appear to float above the St. Lawrence River. He loved working with what he describes as very “colourful” clients. It was one of the first homes the firm designed, and it firmly established its contemporary approach, inspired by the landscape. Bourgeois says he was influenced by certain Scandinavian villas when designing the house. 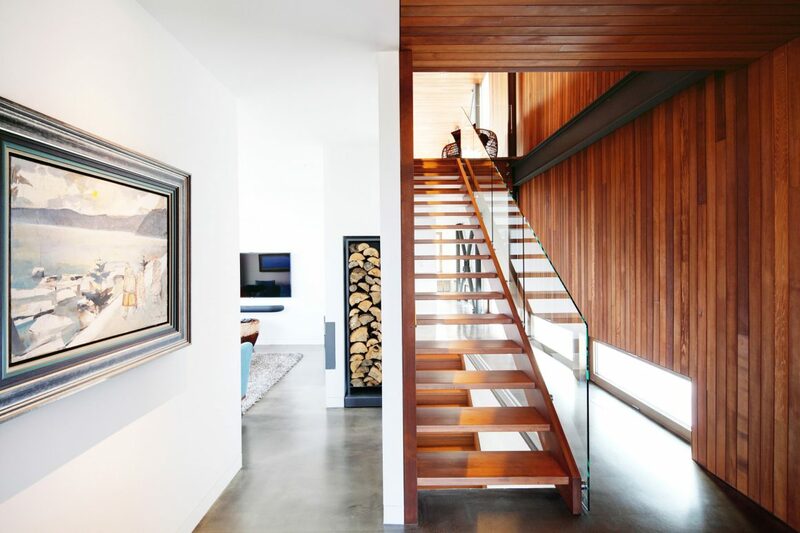 With the widest part of the home being the top-level main floor, the house is described as “floating.” The upstairs main living area capitalizes on the view but it also creates a practical use of space, as well as a covered area for a patio and swimming pool. The lowest level features an office, gym, wine cellar, and access to the pool. The mid-level houses the children’s quarters with two bedrooms, a bathroom, mud room and living room. 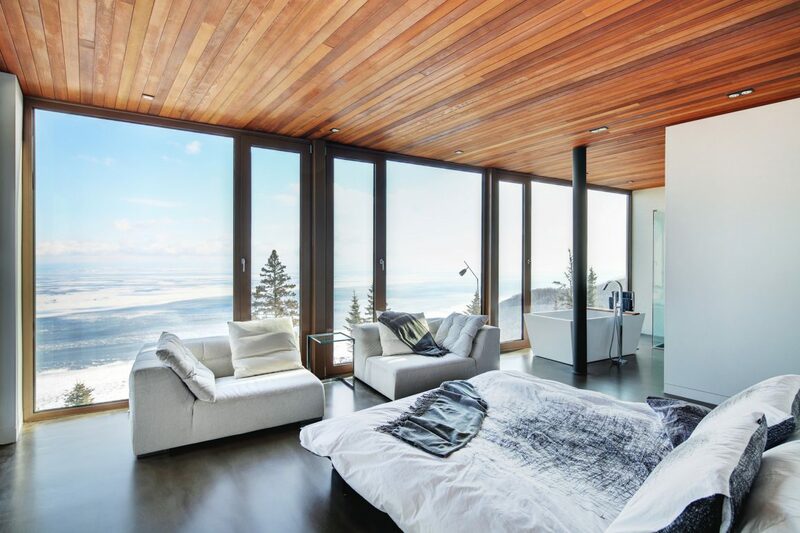 And the upper level houses the master bedroom and ensuite bathroom, with spectacular views from both the bed and bath, as well as the living room, kitchen and dining area. The concrete floors and mostly white furnishings are warmed by the red-cedar ceilings and the splash of colour from the Ligne Roset sofas. 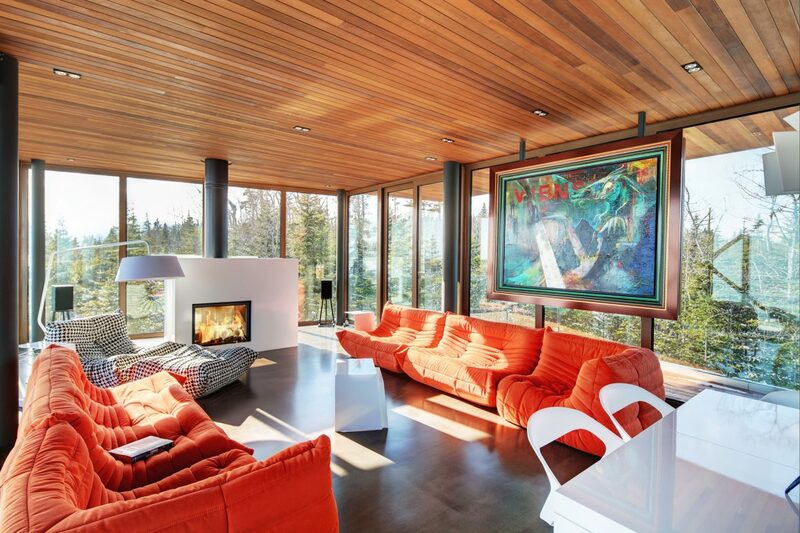 In the autumn, Marc says, the sofas really seem to bring the fall foliage colours surrounding the house right indoors. 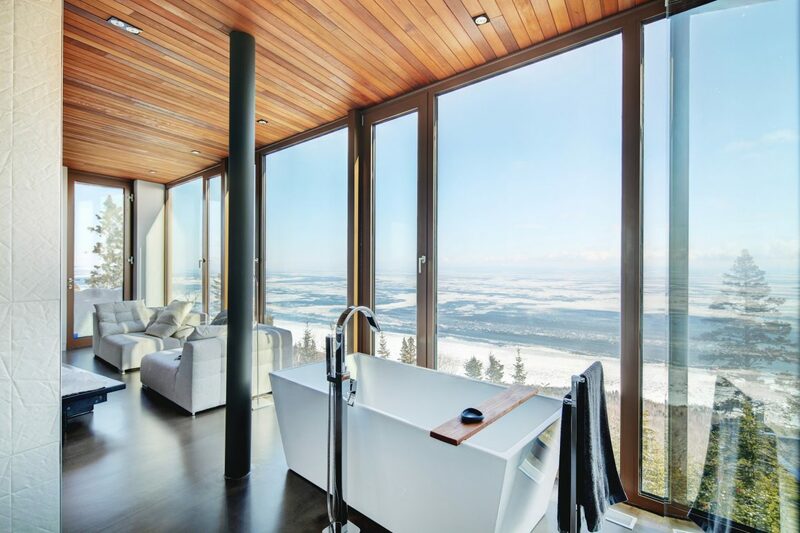 The spectacular master ensuite bathroom offers stunning views in a spacious, sumptuous and private retreat that is gloriously sunny and where a soak in the tub is divine. One of the master strokes of the main level is the gorgeous Stûv fireplace that floats in the midst of glass walls. Bourgeois cleverly designed a lift in the basement to haul up logs for the fireplace. 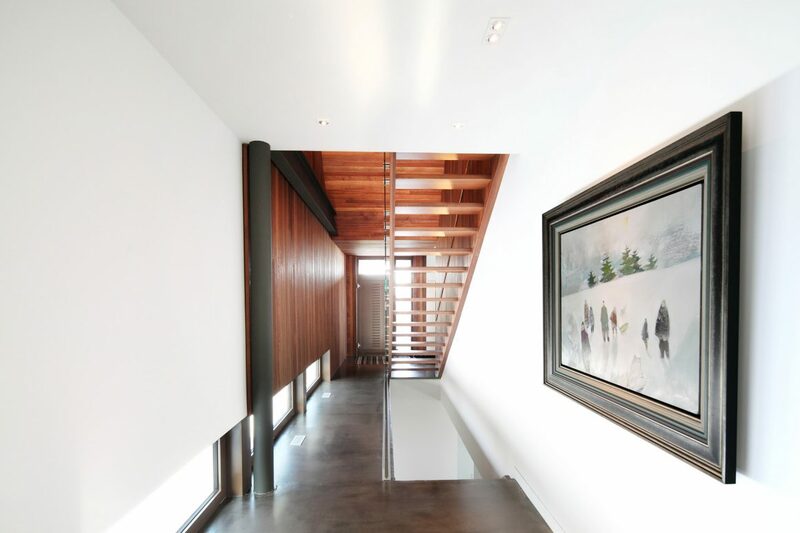 Another unusual item on a glass wall is a painting by Montreal artist Dominic Besner. Bourgeois came up with the idea of suspending it on the glass wall (without obstructing the view) and Marc says it really showcases a favourite art piece well. 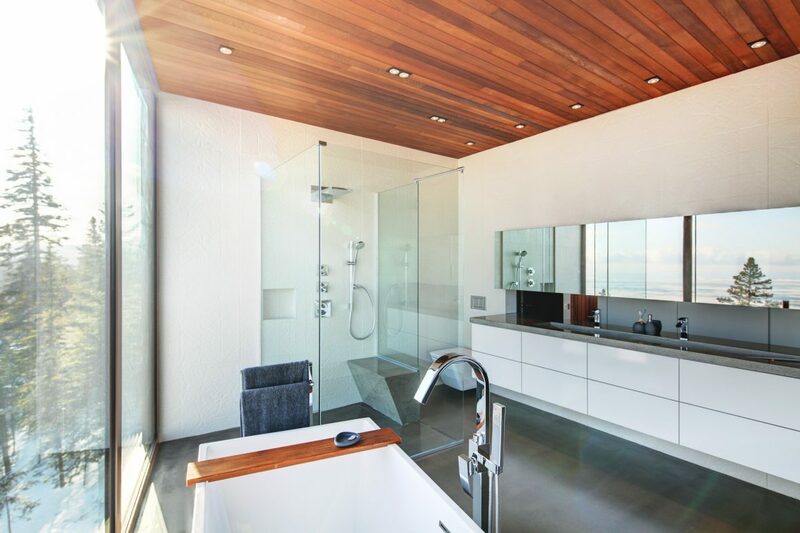 The X braces which define the glass walls are another unique feature. Normally, says Bourgeois, they would be contained within a wall for structural support. Here, he decided to use them as a funky accent in the contemporary living room.